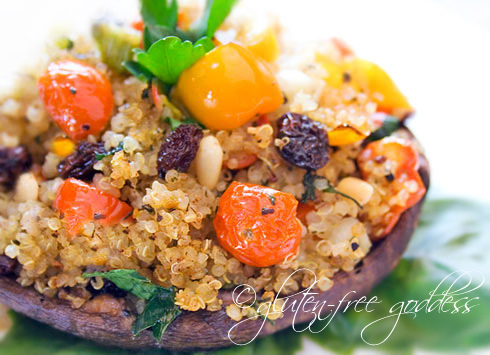 Quinoa stuffed portobello mushrooms are a lovely vegan nosh. The stars are tuning their alignment in our favor. After eighteen months on the market (and more than once price reduction along the way) there are rumblings of a house sale. Negotiations are afoot. We are walking on Easter egg shells through the weekend. Monday will bring us definitive news. Send kind and generous thoughts to our buyer. Wish him luck with his bank. We've been preparing for good news, sorting through books both old and new. Stripping away much of what we've accumulated since our last move. Lugging movies and art books and cookbooks off in recycled Whole Foods bags to the used book store in Santa Fe . Those things we carry. We took the cash and bought wine, gluten-free flours , olive oil and boxes of tea. Not enough to last through May. On purpose. We drove up to Abiquiu this week, driving by Georgia O'Keeffe's place, tucked back in the hills above the highway. We have never seen inside. We have never taken the tour. Steve said, It might be now or never. Call if you want to set up a time to see it. Who knows if we'll be back this way. We won't, I said, be back this way. The drive home was quiet, the brown landscape on either side of us dusty with the gusts of spring wind. I thought about community. Belonging. Roots. The elusive sense of home I have never quite felt. She loved it here, I finally said. To her, this was home. And me. I thought I might, too. But I'm a tourist. Steve shrugged. I know he understands. He feels it, too. That gypsy restlessness to move on. That search for home. When in truth, we carry it with us. We introverts and artists. Yes, we may settle in for awhile and play house, plant a garden, move stones with muddy hands. But one eye is always on the horizon. Wondering what might be next. Knowing that what lies ahead will not, somehow, be here. Whatever home is we bring it with us in some unspoken place. So here we go again. Shedding old things. The coyotes could care less. 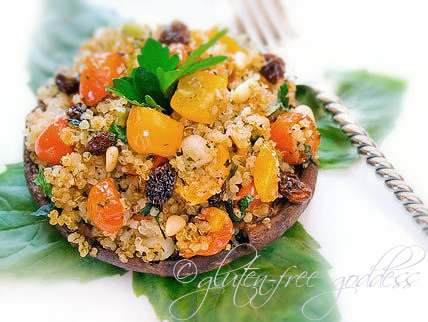 Quinoa stuffing makes this mushroom a complete vegan meal. This is an easy make ahead gluten-free vegan side dish. Make quinoa in the rice cooker to save effort and time. Add tidbits of your favorite veggies or seasonings. My version is vegan, but if you enjoy cheese, add crumbles of goat cheese or sheep feta to the mix. Preheat the oven to 350ºF. Lightly oil the bottom of a baking or gratin dish. Gently clean off the mushroom caps; slice off the stems and using a sharp teaspoon carefully scrape out the gills. Place the caps in the baking dish . Drizzle with a scant amount of olive oil and a touch of balsamic vinegar. Season with a little sea salt and pepper. Pre-bake the mushrooms for about 15 minutes to soften a bit. In a skillet , heat a little olive oil and toss in the garlic. Stir for a minute. Add in the cooked quinoa, tomatoes, scallions, raisins, pine nuts. Season to taste with sea salt and ground pepper. Stir to combine. Moisten with more olive oil, as needed. Gently heat through, briefly. Remove from heat. Add in the fresh chopped herbs. Stuff each mushroom cap. Bake in the oven for 15 to 20 minutes, till the mushroom cap is tender. Tent with foil to keep it moist. You can also assemble these ahead of time, and refrigerate. Bake at 350 degrees F. for 30 minutes or more, as needed.